Everywhere you look, someone is trying to convince you that their weight loss approach is the only one that works. Many even go so far as to say that any other approach is stupid or dangerous. 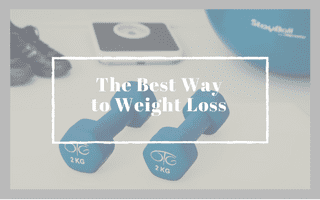 This article will help you find the right weight loss approach for you. Many people will try to convince you that their method works because of some confusing, unique, or scientific reason that you couldn’t possibly understand but you should totally trust them. Ultimately one thing holds true no matter how you choose to approach losing weight: you must be taking in fewer calories than your body is using. This is called a calorie deficit. Every single dieting method boils down to this fact, regardless of whether you’re eliminating foods, counting points, restricting your feeding window, or simply focusing on how full or hungry you feel. There are other factors that can – and will – contribute to your overall success with a certain approach but without a calorie deficit, you will not lose weight. Intuitive eating is a catchy way of saying you are paying close attention to your body’s hunger and fullness cues as a method of losing (and eventually maintaining) your weight. This typically goes hand-in-hand with day-to-day actions that are likely to get you closer to your goal, such as eating slowly in an undistracting environment to help familiarize you with those fullness cues. This is typically a non-numbers based approach, using such methods as estimating portions using your hand. Staunch advocates of intuitive eating may claim that a more numerical approach is obsessive, unhealthy, unnecessary, and inaccurate. Pros: Helps you familiarize yourself with your body’s signals so you aren’t relying on external factors to dictate when/what you eat. No food restrictions, focus is on listening to your body and indulging moderately when it’s worth it. Results are often sustainable because they’re the result of daily habits & practical behaviors. Cons: Often requires a good deal of introspection. May be slow going & frustrating when you aren’t seeing changes as quickly as you may like. May feel too abstract or vague, especially for certain personalities. -You’re willing to do some soul searching about how you’ve ended up overweight and what you can control to change your circumstances. -You are willing to take longer to reach your destination, knowing you’re more likely to stay there once you arrive. -Numbers and/or restriction lead you down an obsessive or unhealthy road. What do Weight Watchers, If It Fits Your Macros, and calorie counting all have in common? Whether it’s points, macros, or calories, you focus on hitting – but not exceeding – a daily or weekly target to help you match your intake to your body’s needs. They ensure (or, make it as likely as possible) that you are in the calorie deficit necessary to lose weight. I prefer macro targets over a system like Weight Watchers because learning about macronutrients can teach you valuable information about portion sizes, the nutrient content of food, and how to fit indulgences into your diet. A points system is arbitrary and requires learning a new method that doesn’t translate well into the real world when you’re ready to stop using the Weight Watchers system. Pros: Teaches you valuable info about personal energy needs, portions, and energy content of food – all good skills to have in the tool box for long-term success. May help remedy all-or-nothing mentality of other diets by teaching how to eat indulge without derailing progress. Cons: Can be abused as a way to justify eating junk food. May encourage relying on external factors rather than listening to body’s cues. Requires consistent tracking & logging of intake. May be a learning curve. May encourage obsessive behavior in certain personalities. -You prefer a numbers-based approach. -You are tech-savvy and willing to learn how to use a tracking app. -You are not easily discouraged by learning new skills. -You like the idea of fitting any food into your diet. Several popular weight loss approaches require you to restrict or eliminate certain types or groups of food. In this category fall keto, paleo, Whole30 (not intended to be a weight loss diet but many use it as such), and intermittent fasting. With ketosis, you severely restrict carbohydrates. With paleo, you eliminate grains and dairy. Whole30 is a stricter take on a paleo diet, limiting grains, dairy, soy, sugar, legumes, and more. Intermittent fasting does not restrict food itself, instead, limiting the amount of time each day you are allowed to eat. Some of these approaches do provide additional benefits for certain groups of people, for example, ketosis and people with epilepsy, or elimination diets for people with certain autoimmune diseases. For weight loss purposes, they all create a calorie deficit by limiting the foods or window in which you are allowed to eat. Cons: May be hard to stick to depending on how restrictive you find the rules. May make eating at restaurants more difficult. May work in the short-term but prove unsustainable long-term. -You just like to be told exactly what you can and cannot do. -You want quick results, even if they may not be as sustainable. -You do not want to learn a new app or spend more time on self-reflection. -You have an easier time with abstinence than you do moderation. Length of Commitment – Using the approach at hand, how long do you estimate it will take you to reach your goal? Are you willing to commit that amount of time to the approach? The last thing you want is to hop from one diet to the next, never giving any of them enough time to work. Ease of transition into lifestyle – How large a change will this be for you? Will you need to clean out your whole kitchen and restock with different foods? Will it be conducive to your work/travel schedule? How much of an upheaval will it be to transition into this diet? Sustainability/Long-Term Outlook – Commonly overlooked is what to do after the diet ends. If you choose to go with a short-term approach, do you have a plan in place to transition to a more sustainable method to maintain your results? Many people have spent years ignoring or overriding their body’s signals and as a result, trying to jump right into an intuitive approach to diet often proves frustrating. Some people see great success with restrictive or elimination diets but repeatedly regain the weight because they don’t have a plan in place to ease themselves into a more moderate, longer-term approach. Other people initially thrive with the freedom that a numbers-based approach can afford but eventually find themselves a slave to the numbers and burnt out. Ideally most of us would like to see some quick results to motivate us to continue, to continue seeing results while not feeling super restricted or put out, and then to maintain our weight loss as effortlessly as possible, without having to do math or travel with measuring cups. The above is totally possible using a combination of the approaches listed above. Phase 1: Kickstart your initial results with a more rigid, black-and-white approach that really simplifies the weight loss process. This may look like an elimination diet or a template listing “approved” foods. This will likely not be the diet you want to stick to long-term but a short-term commitment to it will help you prove to yourself that you can do this and you’ll have some initial weight loss to inspire you to continue. Give yourself about a month in this phase; long enough to see progress but not so long that you’re tempted to “cheat” or bend the rules. As a bonus, you may learn something about your food preferences and how eating (or not eating) certain things makes you feel. Phase 2: Continue getting results by transitioning into a less restrictive, numerical approach that will give you more freedom in the foods you eat and teach you about the energy content of food, portion sizes, and your personal needs. I recommend a target calorie range and protein goal, if not full macro counting. After the initial learning curve of figuring out how it works, this will prove to be a simple and sustainable method for continued weight loss. Spend as much time here as you’d like. Transitioning carefully from the previous phase to this one will help show you that you do not need to follow an unpleasant or overly restrictive diet in order to lose weight. When you’ve reached a healthy weight or are feeling burnt out from counting and tracking, it’s time to wean yourself. Phase 3: Put the skills you built in the previous phase to use to help you transition into a more intuitive approach where you can maintain your weight loss long-term without relying on measurements or tracking. Through your experience with tracking your intake, you’ll have learned invaluable information about how much food your body needs, what portions are appropriate for you, and the energy content of your everyday foods. Time to start applying this info to ease into long-term maintenance. -Starting to eyeball portions and using a scale to double check. -Not logging a meal each day or a day per week to show yourself that the weight won’t come piling back on the second you ease up. -Estimating portions and paying attention to when you feel full. -Focusing on actions like eating slowly, eating mostly whole foods, and making sure most of your meals are well balanced. Take as long transitioning from phase 2 to 3 as you need to feel comfortable loosening the reins and relying on your skills and body awareness to maintain your weight. If the thought of trying to lose weight one more time makes you want to pull your hair out, remember that you do not have to do it alone! I’ve helped hundreds of clients lose the weight but keep their sanity and I’d be happy to do the same for you. If you know you need to make a change and know that some guidance and accountability would make your life easier, fill out this application to work together!